Triple pleat or ‘pinch pleat’ curtains have a classic formal finish making them ideal for sitting rooms or dining rooms. 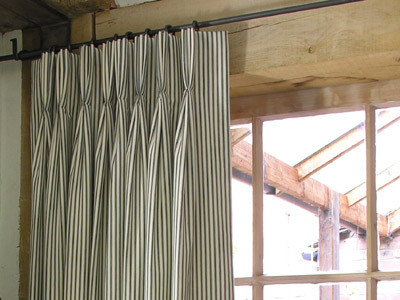 With a neat tailored look, triple pleat curtains work best when hung on a pole rather than a track. Ideally they should hang below the pole as pictured. A major advantage of triple pleat curtains is that they ‘stack back’ very neatly and in a relatively small space, making them the perfect choice for door curtains or windows with little wall space either side for ‘stack back’. Tinsmiths’ triple pleat heading curtains are made by hand, so there will not be a tape on the reverse of your curtain, but instead a buckram is stitched into the curtain top to provide support for the pleats & a solid platform for the ‘pin hooks’ which are used to hang the curtains. Because our triple pleat curtains are made by hand we can often offer to match a stripe to the centre of pleats when making curtains in a striped fabric. As a general rule we make our triple pleats 12.5 cm long, however for short sill length curtains we might advise 10 cm and for very long curtains, with a drop of over 250 cm we would advise a 15 cm pleat length. the length from the bottom of the pole to where you would like the curtain to finish with 1cm deducted – this will be the finished length of the curtain. 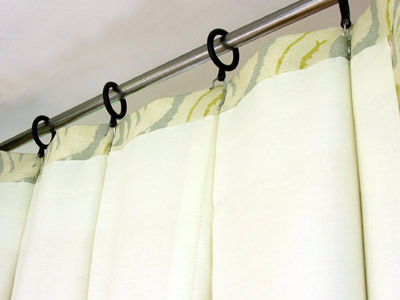 Triple pleat curtains work best hung on curtain poles. We would strongly advise that the curtain poles are in position before you measure for curtains. It is disappointing to have your curtains made up and then to realise that your pole cannot be fitted where you had planned. A dicey bit of wall, steel lintels etc can all make fitting the pole unpredictable. 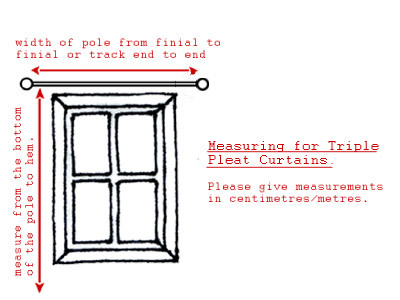 With pole in position when you measure, your curtains will then be properly ‘made to measure’. We would recommend that the pole be 30 – 44 cm wider that the window (15-22 cm either side). If space is limited on one or both sides ‘recess’ brackets may be a consideration; some of the curtain poles that we stock can be supplied with recess brackets, please enquire. We would recommend that the bottom of the pole is between 6 & 12 cm above the top of the window depending on the space available. Your curtains will already have pin hooks in place; one on each pleat. Hang your curtains up, removing any rings not required. 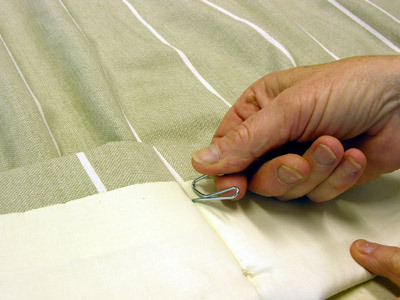 The curtains should hang below the pole, but minor adjustments to the length (1cm or so either way) can be made by repositioning the curtain hooks – just make sure that when repining the pin hooks go through the ‘buckram’ (stiffening) in the curtain heading, the lining alone is not strong enough to hold the weight of the curtain. If your pole or track is ‘sticky’ to pull get some silicone spray – spray it on a cloth and then rub all over the pole/track and the rings/sliders (‘Pledge’ furniture polish has quite a lot of silicone in it which makes it just as good for wooden poles if you have some in the cupboard – do spray it on a cloth first). If after a couple of years your curtains stop ‘stacking’ nicely as they did when they were new, just take a bit of time to arrange the pleats how you want them and then tie some bands of cloth or polythene around them, leave for a couple of days then untie & they should be retrained. See our information page for curtain care instructions. They are great. I love them.